The bottom line: Mountainsmith's Carbonlite Pro Trekking Poles provide a great value for any hiker looking for more stability and distributed weight on and off of the trail. While there are lighter hiking poles out there, the quality construction, twisting lock and shock absorbing mechanisms, and ergonomic cork handles more than offset any weight differences. And given the low price point, the value proposition is high. These are rugged and durable hiking companions that will be reliable hiking tools for years to come. 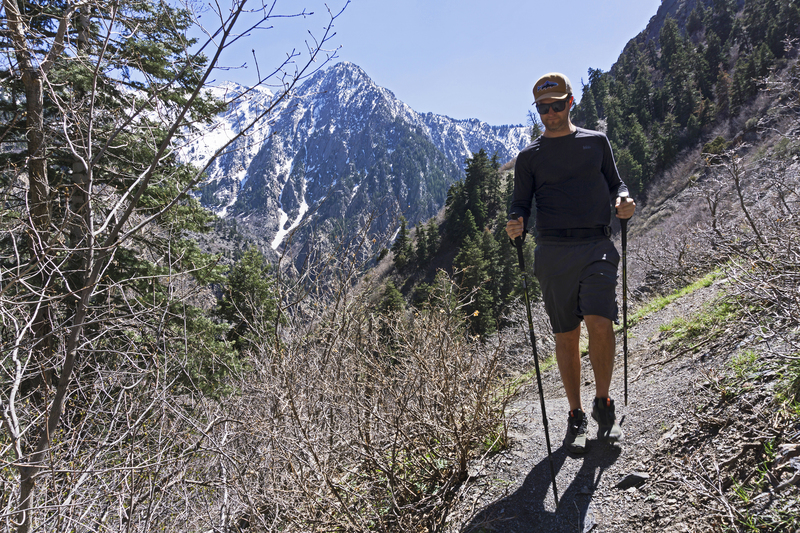 Hiking in Big Cottonwood Canyon with Mountainsmith's Carbonlite Pro Trekking Poles. Photo by Kyle Jenkins. I used to think all hiking poles were pretty much the same until I started using Mountainsmith's Carbonlite Pro Trekking Poles. Since using these poles, however, I've been exposed to a higher level of construction. Combining strength and versatility in a lightweight but sturdy package, these trekking poles are a great choice to augment your hiking experience this season. And considering their low price, they are a great value as well. I have owned my pair of Carbonlite Pro poles for a little over a year and have taken them over miles of terrain in a wide range of conditions, and I have yet to discover a major flaw. The first thing I noticed about these poles when I took them out of their packaging was the Rasta-themed color scheme Mountainsmith used when designing them. It gives the poles a happy vibe that makes it easy to rock them out on the trails. The three-piece telescoping aluminum cores are wrapped in carbon fiber, which provides a high level of strength and durability in a lightweight package. The molded cork dual grips are comfortable and are shaped to keep your hands where they belong while keeping moisture and slippage to a minimum. In terms of function and originality, the spring-loaded shocks that can be turned on or off as you hike are particularly notable. Twisting the upper portion of the poles a quarter turn activates the shock system, which absorbs a small amount of the downward force exerted on the poles. This lessens the impact on the equipment as well as your hands, wrists and elbows. The shock absorbers make any descent a much more comfortable experience than it would be using poles without this feature. And being able to turn off this absorber on ascents is a game changer. The Carbonlite Pro poles use a twist lock system to keep the various sections adjusted to the correct height, while a number of other manufacturers stick with a flip lock that clamps down on adjustable sections. The flip lock may be more functional and accessible for gloved hands, but I found that I easily preferred the twist lock style in most conditions. It is a great way to save a little weight, this system holds much tighter than the flip system, and there are fewer bulky pieces for cords and clothing to become caught on. The poles are well marked with height increments and labels to keep you from extending them too far. These poles can reach an impressive 57 inches, which makes them great for taller hikers who have a hard time finding poles. The poles have more give to them at their full extension, but they are still plenty sturdy when kept within the maximum extension limits. They are great for people carrying heavy backpacks because each one can support 160 lbs of weight at a time. I also enjoy the double grip feature that allows users to quickly and effortlessly reduce the height of the pole depending on the grade or stability of the terrain. Essentially, Mountainsmith added a second grip beneath the main grip, which allows you to move your hands down the pole a few inches to immediately make the poles seem shorter without adjusting their length. Rubber tips are included in the package to reduce the noise while hiking in the summer, and powder baskets are included keep these poles winter-ready, as well. Remove the rubber tips to reveal the carbide tips that will provide years of exceptional traction. And after years and miles of use, these poles are just getting started. The Carbonlite Pro poles may not be the lightest poles you can find, but in terms of their versatility, capability, and weight limits, these poles are a solid value.